Mary Louise Schecter (Director) - Mary Louise Schecter (BA Music Education, The College of Wooster; MFA in Voice Performance, Southern Illinois University) began choral conducting in 1971, at the beginning of her 34-year career as an elementary and middle school music teacher in the Weston Public Schools. Her goal throughout has been to foster the love of music, encourage enthusiastic participation, help choristers develop their singing voices, and encourage them to appreciate that cooperation produces the most gratifying results. 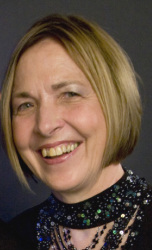 Since retirement, Mary Louise has directed a number of adult and children's choruses in the greater Boston area. She is Founding Director and Accompanist for the MetroWest Performing Arts Center Children's Chorus; Director and Accompanist for Sangerchor Boston, a German-language adult chorus; and Accompanist for the Weston Public Schools Middle School Chorus. In addition, she was previously Director of the Dorchester House Neighborhood Chorus, Boston Children's Chorus (2006-2007); Creator and Director of the Middle School Boys' Chorus at the Rivers School in Weston (2005-2007); and Director (sabbatical leave replacement) of Middle and Upper School Choral Music at Milton Academy (Spring 2005).